On warm days, it's kind of nice to chill outside. Unfortunately, most patio furniture are quite uncomfortable. It's a good thing the Timber Ridge Zero Gravity Lounger Chair makes it easy to lounge around outside. The padding and reclining ability of the Zero Gravity chair ensures the utmost comfort even in an outdoor setting. Think of your favorite recliner that's in your home when you watch tv. Yes, it's like having that chair, but outside. You can be sitting on this chair working on your laptop, reading a book, or just sipping a lemonade while on the Timber Ridge Zero Gravity Chair. You can put it out in the backyard, patio, porch, or outdoor deck, so get one of these chairs and kick back, relax, and enjoy the comfort. You could also get the portable Timber Ridge Camp Lounge Chair or Timber Ridge Director's Chair, so that you can take it with you on camping trips or picnics. If you want more of a poolside type chair where you can lay out, then consider getting this chaise lounge chair also available at Costco, but these Timber Ridge chairs are known for their comfort and outdoor capability. If you want this same Timber Ridge Zero Gravity Chair but in a cool, camouflage pattern for a more outdoorsy look, then check out the camo version. I received one of these for my birthday and when I went to Costco to purchase another they said they were recalled. The recall was not a safety isssue but a staining issue, They might restock or not thay did not know. Hi @Anonymous, thank you for letting us know that there was a recall on the Timber Ridge Zero Gravity Lounger Chair due to staining issues. I had no idea. Hopefully, the new batch of Timber Ridge Zero Gravity chairs fixes the problem and are way better. Just bought one today at Costco so they must have resolved the issue. Hi @S Roberts, that's great that you got one of the Timber Ridge Zero Gravity Lounge Chair! I hope you enjoy your new chair and it lasts a very long time! @ S Roberts: @ what Costco did you buy your chair? 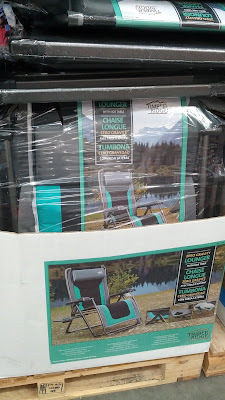 Hi @Anonymous, thanks for letting us know the Timber Ridge Zero Gravity Lounger is available at the Costco in Salem, OR. People looking for this chair in that area will definitely appreciate this info. Bought two in Conroe, Texas and love them for the beach in Galveston. I love they are over-sized and rated for 300 lbs. Hello @Anonymous from Texas. 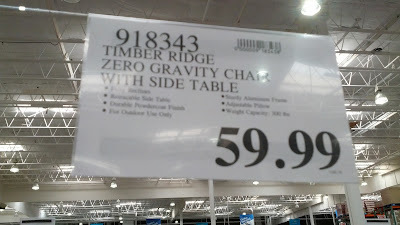 Thank you for letting us know that the Timber Ridge Zero Gravity Lounger Chair is also available in Conroe, TX. I'm glad to hear that these chairs are working out for you. It definitely feels good knowing that you're enjoying these chairs at the beach and making real good use of them. Hi @Tawny, that's awfully disappointing to hear that one of the two Timber Ridge chairs you bought from Costco did not hold up well at all. It's a good thing Costco has a good return policy for items that you're not completely satisfied with. If you want to contact the manufacturer, I learned from Costco that there is no Timber Ridge manufacturer. Timber Ridge chairs are manufactured by Westfield Outdoors and you may be able to contact them at (317) 334-0364. I hope this helps! We purchased two last year, and are absolutely thrilled with ours. We carry them with us when we travel as both my husband and I have bad backs. We have nothing but POSITIVE remarks. Wish we could get at least one more for our son. Hi @Mountain Momma, that's just wonderful to hear that both you and your husband are enjoying the Timber Ridge Zero Gravity Chairs! If it's working out for you, then totally get one for your son...Christmas is coming up too! I'm sure he'll love it as well. Does anyone know why they are listed "for outdoor use only"? Hello @Grandmasewnsew, the reason for the "outdoor only" labeling has to do with the fact that the material used for these chairs no longer meets the fire related specifications for indoor use. A reader of this blog emailed me after she had contacted the manufacturer (Westfield Outdoors), and that's what they had told her after she had asked them the same exact question you had. I guess this applies to all those Timber Ridge chairs you see at Costco including the Timber Ridge Zero Gravity Chair. Hi Matt here in Cave Creek, AZ. I have used mine camping many times. Heck, know its not "rated" for indoor use but I take mine inside when we need an extra for family movie night. Only problem, everyone wants to use it! Does anyone know of a chair bag that would fit this thing? Its stored in the garage, gets quite dirty in there. Thanks! 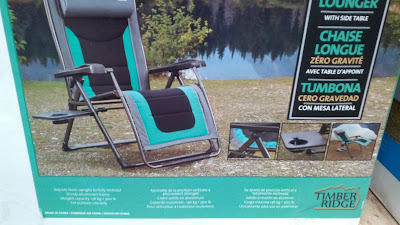 Hello @Matt, that's great that you and your family are loving the Timber Ridge Zero Gravity Chair and are making good use of it for camping and as extra seating for inside the house. Unfortunately, I don't know of a good bag to store this in. In the interim when not in use, I would just use a couple of large garbage bags to wrap it in. That way it's somewhat covered and it won't get too dusty sitting in the garage. I know it's just a quick fix, but it's just a suggestion. I bought one today at Costco in Tucson. Just Love it! Especially after visiting the Relax the Back Store last week. Their chairs are really amazing & beautiful, but prices started at $2,300. This Timber Ridge Zero Gravity Chair is perfect for me and my wallet!!! Hi @Anonymous, I'm glad that you love the Timber Ridge Zero Gravity Chair that you got from Costco. Ya that's why I love Costco. You could easily get some good pretty stuff at Costco for just a fraction of the price of other retailers. This is especially true for furniture.